I promised that I would put up reviews of the vendors I used for the smaller details of the wedding. I’m going to start with the ceremony first and then move on to the reception. First, I would like to say that most of these photos were taken by Sadie Hodge of Sadie and Jess Weddings. I did a pre-review for her here and you can find their Facebook page here.I’m going to include things that I bought as well as things that I made and was inspired by something on Pinterest, online, etc. I will try my best to site the resources for you. And here we go! At the bottom, there is some text that I think was very helpful. It says, “Please do not use any flash photography during the ceremony. Be respectful of our hired photographers. Also, please put your phones on silent. Thank you!” We commissioned everyone at the rehearsal to mention it to guests. I had originally planned to have some sort of verbiage like this, but that was only strengthened after reading this. We worked out the order of the ceremony with my pastor and included instructions for communion. 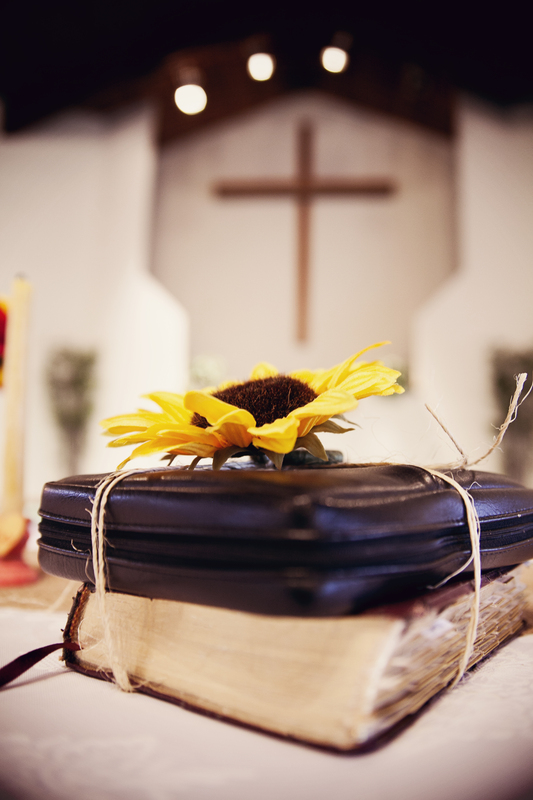 We (Matt and I) love communion and since we are coming from two different churches, not to mention the many churches represented by other friends and family, communion is a great way to draw unity with a diverse group of people. Different churches have different traditions in the act of communion, so we had to make sure everyone was on the same page. It worked out wonderfully! Matt and I have great love for our families. We both have lost two grandparents each, one from each side in the last 4 years. We wanted to include those who couldn’t be there as much as possible. We know they’re in heaven, and would’ve been so glad to be here for our wedding, but God decided to take them on home. What you see here is my Pappy Cook’s Bible and Matt’s Grandpa Charles’ Bible. It was inspired by this pin. My grandma decided to give Pappy’s Bible to my nephew, Jason, who was a junior groomsman in the wedding. It has his notes and everything and I heard that Jason just loves it. Pappy is touching our lives and discipling us even after he has left earth. What a testimony that man has. This is a two part mention. The candles came from The Oliver Company on Etsy. They have all sorts of home sweet goodness, beeswax coming straight from their own hives. I just checked the shop and didn’t see the unity candles on there, but I’m sure they will be back. In the meantime, check out the other great products they have from lip balm and honey soaps to burlap flowers and bows. The stands came from Morgan Hill Designs. I was looking for something unique and something that could be customized to our wedding colors. Totally found it with this purchase. I loved the “His” “Hers” and “Ours” labels. 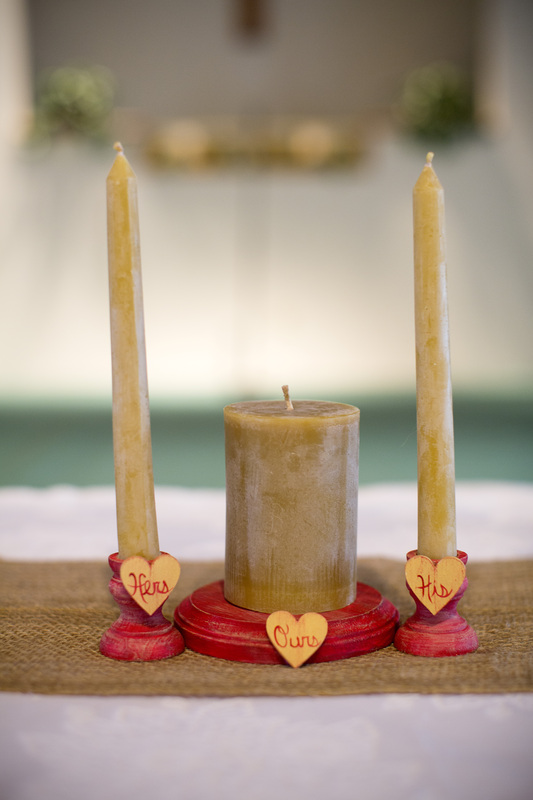 I haven’t found a place for the His and Hers yet, but the Ours with the pillar candle is displayed with some other things from the wedding in our living room. It is perfect. There is a guide for paint colors on the shop and you just have to designate what it is you would like. I just took another stroll through her shop and there are 75 pages worth of items! all hand-carved and painted. So many unique finds and completely personalized. Be aware that there is a bit of a turn-around time. She is up-front with the prep time so be sure to read the fine print so you’re not disappointed or act too late. We got most of Matt’s outfit from JC Penney. 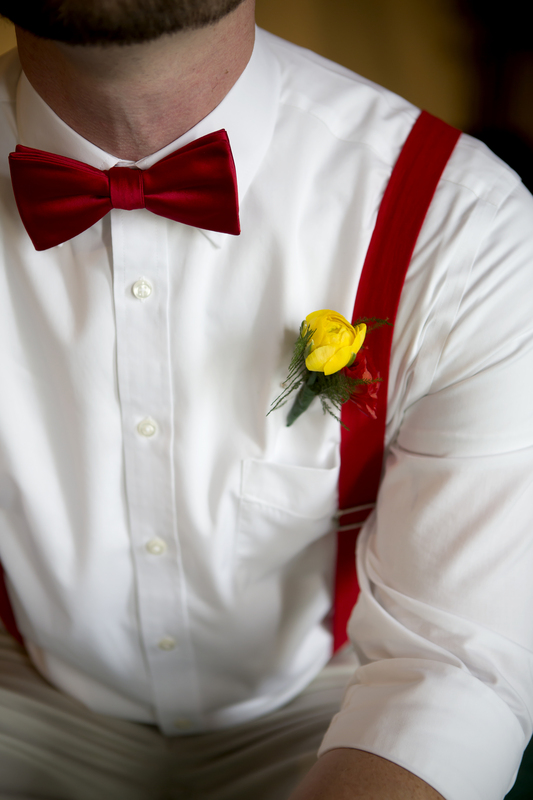 My original thought was that he would be in all red with the khaki’s, but he wanted to make sure he stood out from the groomsmen, who would also be wearing red and yellow. He chose a white shirt and we managed to find a red bow tie at the store. However, the red suspenders proved a little more difficult than we anticipated. I thought that with the hipster culture going on right now, suspenders would be super-easy to find. No go. I looked everywhere and it just wasn’t happening. Naturally, I redirected to Etsy. Dapper Gent is THE place to go when you are looking for suspenders, bow ties, or matching sets. I found what I was looking for quickly and received our order in record time. It was good, we were running close on time. The cost was a little more than I was anticipating, but at that point I was willing to pay a little more to get what we (ok, I) wanted. They have so many cute sets for kids. Absolutely precious if you have a boy and he’s cool with stepping up his style. I chose to go minimal. My dress was so detailed and beautiful that I didn’t want too much else taking away from it. My makeup was minimal and done by my MOH. The hair complemented the dress (wish I had a good picture of my hair, but I don’t) but I still wanted a pop of color and a way to tie myself into the wedding besides my flowers. This necklace was just the ticket. It matched the dress perfectly and combined the wedding colors in a way that I swooned for. 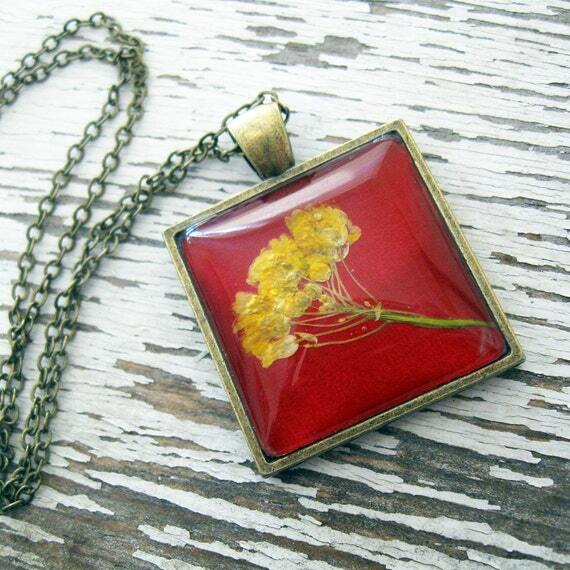 I bought it from Winter Garden Studios on Etsy. I had originally wanted to find a jeweler in my own area, but this was far and beyond what I could’ve wanted. Here’s the best picture I could find of me wearing it. These earrings were for my Matron of Honor. I fell in love with these when I saw them. If I could wear earrings, I probably would’ve got them for myself. 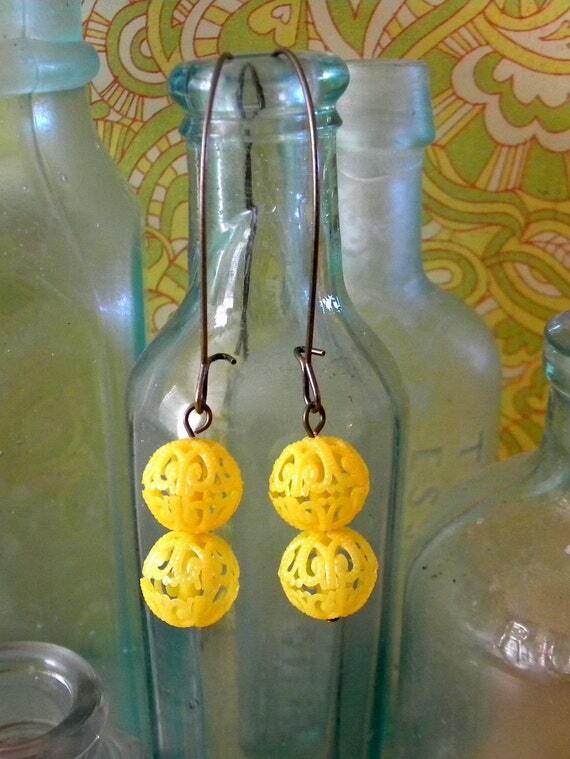 I bought them from McKee Jewelry Designs on Etsy, which I would link for you, but Etsy says she no longer exists. That’s sad. 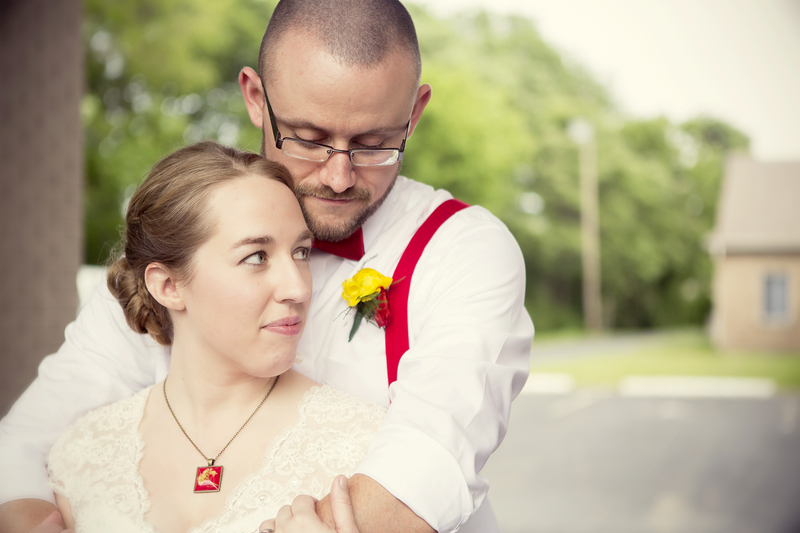 Lanna (MOH) was wearing yellow for the wedding, so her accents were all in red. 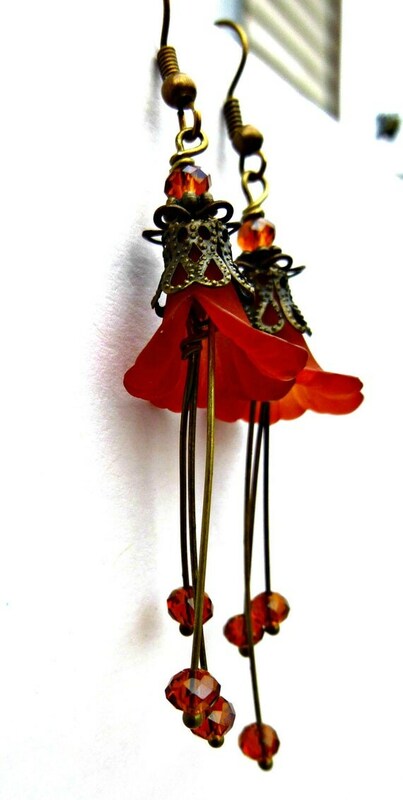 These earrings were for my two nieces who were the junior bridesmaids of the wedding. They were wearing red dresses so their accents and flowers were mostly yellow like Amy’s. 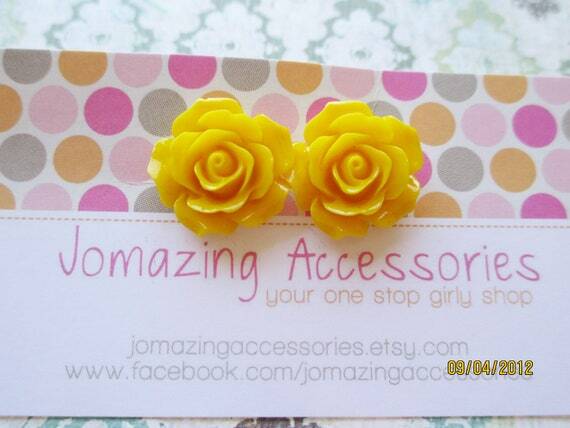 JoMazing Accessories has quite a bit in their shop so I recommend stopping over for a visit. She’s currently on vacation, so give it about 3 weeks. You can find more about the wedding by checking out the Countdown Post. I posted each week leading up to the wedding and detailed a lot of the preparations for the big day. 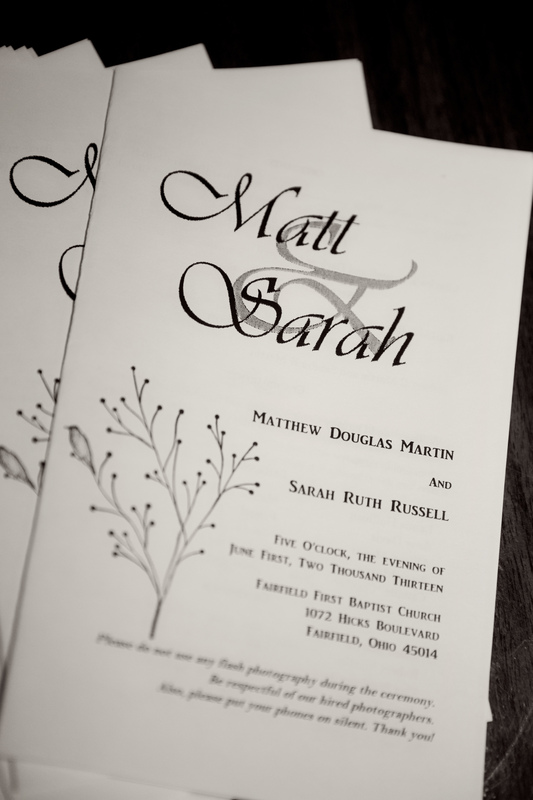 Soon to come, Wedding Details – Reception.